Darwin Fish: A Critique Video version! A reader asked us to have a look at the teachings of one "Darwin Fish," a cultic figure who claims to be the head of the only group of people heading for heaven, while all others (including others who say the same) are headed for perdition. I find as in several cases that a thorough expose' of Fish has already been done by others with more experience (see link below), so my own comments will be brief, and probably serve mainly the purpose of getting me added to Fish's "bad list". Fish rejects scholarship (naturally) in favor of "plain readings" of the text. Looking oddly Mormon, he teaches that God is a human being in form, albeit one that was always incorruptible (see Chapter 1 of my book The Mormon Defenders), and sanctions polygamy. His positions are often excessively legalistic and picayune; at one point he even decreed that communion served in small cups and with small crackers was "unbiblical" and resulted in condemnation. He counsels active "hate" (in an anachronistic sense) of those who disagree with him. All this said, Fish, like anyone, gets some things right, if only because it is like "shooting fish in a barrel" (e.g., finding false prophecies made by Benny Hinn). To round things off here, I'll address some of the claims found on Fish's site. Articles there are mostly either profiles of persons or ministries/groups (including cults) with an accounting of damnable errors, or are issues-oriented. The "issues" articles are the only things that cross my scope, and comments on a couple in particular will suffice to expose Fish's exegetical methodology. ....Dr. Pietrylo supports this conclusion, not with Biblical proof, but rather he uses the testimony of Aristotle, The Donovan Bible Commentary, Smith's Bible Dictionary, and his own words, which all prove nothing; because Scripture is the standard, not Aristotle, Donovan, Smith, or Pietrylo no matter what they say (Colossians 2:8-10)! It's no surprise of course to see Colossians 2:8 misused in the usual fashion (see here), but overall this is the usual error of Sola Scriptura Extremis, which rejects informing contexts. We are sure, however, that if Fish found a word in the English Bible he did not know, he would not reject using a dictionary to find out what it meant. From the articles, it IS likely that Fish has consulted at least a concordance, however, which by his own standard is composed by "men" following linguistic "traditions". Fish however even goes as far as rejecting Pietrylo's account of how wine was made in antiquity because it "is nowhere substantiated in Scripture". For Fish, the Bible is the ONLY source for ANY truth, apparently. The wine was stored by boiling the juice until the water was evaporated. What was left was a thick, nonintoxicating syrup or paste. Fish somehow gets from this that purposeful evaporation to create wine as described is the same as agricultural failure. Some of the sources Fish critiques are, by the way, correct that wine in Biblical times was not as strong, and though Fish is correct in deeming this irrelevant as it is used by these commentators, as before his main issue is that proof of this is not found in the Bible, so that he essentially argues as though when the Bible wrote of "wine" it clearly meant it in the same sense -- level of alcohol, for example -- that it did for the bottle of Morgan David at the ABC Liquor. To be sure you understand, he warns you with Prov. 30:6, "Add thou not unto his words, lest he reprove thee, and thou be found a liar." In that case, all of Fish's commentaries on Scripture are no better. Amazingly then, to "refute" the historical process of mixing water with wine, well documented by historians, Fish cites Isaiah 1:22, "Your silver has become dross, your wine mixed with water," so that it is said that mixing wine and water is a "bad thing". Fish merely arbitrarily hops from the description of this wine as diluted and designates it "bad" in all cases, whether the dilution is 1% or 99%. He then supposes that Is. 1:22 was some sort of winemaking precept followed by all winemakers of whom every Biblical writer was aware. Fish amazingly accuses this commentator of "historical tunnel vision" and remarks, "Just because modern man records distillation as first being discovered in A.D. 1500, this does not mean the ancients of old did not use distillation," and cites Eccl. 1:9, "there is nothing new under the sun". Not only is this exegetical abuse of Ecclesiastes and its genre (see here -- is "what's new" restrained to narrow categories like "specific methods of winemaking" or to broader categories like "wine making, by any means"? ), it is an approach that avoids the data rather than dealing with it. Fish essentially hypothesizes that there must have been secret, unrecorded methods of distillation to make liquor that strong. Fish actually believes that to say that arguments are "only supported by arguments from history and the supposed practice of that day," means he has exposed a problem in historical epistemology. Much of what else is written is sound on this topic, with the notable exception of using Proverbs 31:6-7 -- again, an misuse of proverbial literature (see link above) -- to justify buying drunkards more alcohol so they can drink even more. In an article directed against Catholic canonization of the Apocrypha, we find a great deal more contrived treatments. As for example we note the NT's use of certain apocryphal documents (see here, some of this will be of interest, notably where Fish addresses such documents useful in our arguments. And others were tortured, not accepting deliverance, that they might obtain a better resurrection. It happened also that seven brothers and their mother were arrested and were being compelled by the king under torture with whips and thongs, to partake of unlawful swine's flesh....When he was utterly helpless, the king ordered them to take him to the fire, still breathing, and to fry him in a pan. The smoke from the pan spread widely, but the brothers and their mother encouraged one another to die nobly...After the first brother had died in this way, they brought forward the second for their sport. They tore off the skin of his head with the hair, and asked him, "Will you eat rather than have your body punished limb by limb?" He replied in the language of his ancestors and said to them, "No." Therefore he in turn underwent tortures as the first brother had done. And when he was at his last breath, he said, "You accursed wretch, you dismiss us from this present life, but the King of the universe will raise us up to an everlasting renewal of life, because we have died for his laws." So, all one has to do is find a document (or make one up) that records someone dying for their faith and having hope in the resurrection, and this means that these are the people the writer of Hebrews had in mind! This "indisputable" reference is an indisputable assumption about what was in the mind of the author of the book of Hebrews! Fish reduces this very complex matter overmuch. 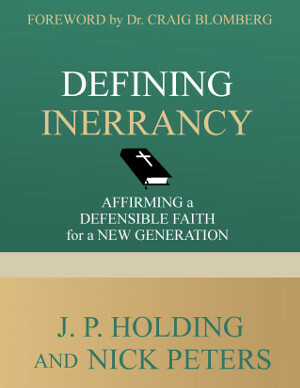 It is not just "finding" (much less "making up") documents, but locating documents that the author is likely to be familiar with in his own social setting, and making content comparisons (as if "dying for their faith and having hope in the resurrection" was attested to in hundreds of other documents). Fish's response amounts to declaring the correspondence a coincidence (which wears thin as the number of such correspondences grows and becomes more dense, as in the article linked above); his charge of "assumption about what was in the mind of the author" is not only easily reversible (he "assumes" the mind of the writer as well) and therefore epistemically worthless, but also stands against every rule for identifying literary allusions (no doubt to be tossed out as the "traditions of men," based on a reading of Col. 2:8). Two such documents we use in our article are then "critiqued" -- The Wisdom of Solomon (WoS) and Sirach. In much of this critique Fish is apparently trying to address ideas that these documents are to be canonical, by showing that they allegedly contain false doctrine; since we do not need them to be canonical, for us this sort of argument is beside the point. Let's look at some of these claims. Wisdom 1:13 says, ". . . God did not make death". Please note Romans 11:36. I did. "For of him, and through him, and to him, are all things." That's it. Fish thinks this is contrary. The verb "make" is not even used in Romans and "death" is not a "thing". The meaning of the passage, at any rate, is that all things belong to God, which is not a statement of creative activity to begin with. Wisdom 3:16-19 says, But children of adulterers will not come to maturity, and the offspring of an unlawful union will perish. Even if they live long they will be held of no account, and finally their old age will be without honor. If they die young, they will have no hope and no consolation on the day of judgment. For the end of an unrighteous generation is grievous. So, in other words, if you are born out of wedlock, you're going to hell and there's nothing you can do about it! This is against Romans 10:13, John 3:16, and Isaiah 55:6f. Wisdom 6:17 says, "The beginning of wisdom is the most sincere desire for instruction." This is a lie. Proverbs 9:10 says, "The fear of the Lord is the beginning of wisdom." Just because someone has a sincere desire for wisdom means nothing (in and of itself). Note Proverbs 1:28, "Then they will call on me, but I will not answer; they will seek me diligently, but they will not find me." Here is someone who has a "sincere desire for wisdom", but wisdom does not come! The lesson here is as helpful as it was for the atheist. Fish also does not seem to be quoting right; it says: "For the very true beginning of her is the desire of discipline; and the care of discipline is love; 18 And love is the keeping of her laws; and the giving heed unto her laws is the assurance of incorruption; 19 And incorruption maketh us near unto God: 20 Therefore the desire of wisdom bringeth to a kingdom." This is a description of what "fear of the Lord" results in. "In Wisdom 6:22 the writer says, "I will tell you what wisdom is and how she came to be, ..." This is a lie. The writer never says how wisdom came to be. The writer does, actually; this (and regarding Sirach 1:1, etc.) is where Fish is unaware of "Wisdom" as a hypostatic figure (see link above). Wisdom 6:24 says, "The multitude of the wise is the salvation of the world," This is a lie. Jesus is the salvation of the world (that is, for any who might be saved). Please note 1 Timothy 4:10. "That is..." The qualifier is the sort of thing Fish does to make an equation. Also the word "salvation" is better read as "welfare" and is obviously not soteriological. Wisdom 12:11 says, speaking of God, "Although you are sovereign in strength, you judge with mildness, ..." This is a lie. Please note Hebrews 10:28 and Hebrews 10:30-31. Both references to final judgment, as it happens, but this is how WoS 12:11 reads: "For it was a cursed seed from the beginning; neither didst thou for fear of any man give them pardon for those things wherein they sinned." Fish has erred in his citation. Wisdom 14:27 says, For the worship of idols not to be named is the beginning and cause and end of every evil. This is a lie. The worship of idols is the result of evil (Romans 1:28), not the beginning or cause of evil. Also, please note 1 Timothy 6:10. Please note rather that WoS 14:27 is literary hyperbole, proverbial in nature. This is like saying that "he hit that ball a mile high" is a "lie". Wisdom 15:17 says, People are mortal, and what they make with lawless hands is dead; for they are better than the objects they worship, since they have life, but the idols never had. This is contrary to Psalm 115:8 and Psalm 135:18. That's creative exegesis. Both passages say, "They that make them are like unto them; so is every one that trusteth in them." This is after a long list saying how idols have mouths but don't speak, and eyes but don't see, etc. which would mean 115:8 is saying that idolaters literally do not see or speak. Apparently Fish doesn't recognize this as a metaphorical insult. Wisdom 16:21, speaking of the children of Israel in the desert, says, For your sustenance manifested your sweetness toward your children; and the bread, ministering to the desire of the one who took it, was changed to suit everyone's liking. This is contrary to Numbers 11:5-6. Where the Israelites complain for leeks and garlic, etc. -- at one time during 40 years of Exodus. That's hardly contrary. Wisdom 7:17 says, "For it is he who gave me unerring knowledge of what exists, ..." This is a lie (obvious from the above). It's also a lie not to complete the quote: "For he hath given me certain knowledge of the things that are, namely, to know how the world was made, and the operation of the elements..."
Sirach 8:13 says, Do not give surety beyond your means; but if you give surety, be prepared to pay. This is contrary to Proverbs 6:1f; 11:15; 17:18; & 22:26. Yes. All proverbs (see link above). Fish thinks these are literal pieces of advice. Does he believe that everyone who hesitates is lost? Sirach also teaches the damning lie of self-esteem. It couldn't have no matter how Fish reads it. The concept of "self" as primary was yet to be thought of; that's what anthropological study shows us. Let's do better than that, shall we? My son, glorify thy soul in meekness, and give it honour according to the dignity thereof. 29 Who will justify him that sinneth against his own soul? and who will honour him that dishonoureth his own life? It essentially says, honor your soul by not sinning. Then: One loses self-respect with another person's food, but one who is intelligent and well instructed guards against that. (Sirach 40:29) I don't find that reading, but this: The life of him that dependeth on another man's table is not to be counted for a life; for he polluteth himself with other men's meat: but a wise man well nurtured will beware thereof. "Self-respect" is read into the text. Sirach 12:4-7 says, Give to the devout, but do not help the sinner. Do good to the humble, but do not give to the ungodly; hold back their bread, and do not give it to them, for by means of it they might subdue you; then you will receive twice as much evil for all the good you have done to them. For the Most High also hates sinners and will afflict punishment on the ungodly. Give to the one who is good, but do not help the sinner. This goes directly against Luke 6:27-36 and Matthew 5:38-48. It does? We're not told how, but the intent of Sirach is one Fish would otherwise agree with, and does in practice: For the most High hateth sinners, and will repay vengeance unto the ungodly, and keepeth them against the mighty day of their punishment. Luke and Matthew meanwhile speak of doing good to those who do evil to you (and in specific contexts -- i.e., here) -- not doing good to just any sinner. Sirach 20:30 says, Hidden wisdom and unseen treasure, of what value is either? Better are those who hide their folly than those who hide their wisdom. In other words, "those who hid their folly are better than Christ."! Because, Christ hides His wisdom. Sirach had Christ in mind, 200 years before Christ? And he meant this proverb to be universal? Sirach 25:24 says, From a woman sin had its beginning, and because of her we all die. This is a lie and contrary to Romans 5:12. If it is, then Romans 5:12 is contrary to Genesis. As it is, Adam is used in Romans as a corporate head for humanity, not as a statement of chronology as in Sirach. More foolishness can be found in Sirach 26:5 which says, Of three things my heart is frightened, and of a fourth I am in great fear: [here's an ungodly fear] Slander in the city, the gathering of a mob, and false accusation - all these are worse than death. Worse than death? Jesus said to rejoice over such things (slander and false accusation, Matthew 5:11-12). He said to rejoice in such things when it is done for his sake. Sirach lived 200 years too early for that and was not a prophet. Sirach 28:18 says, Many have fallen by the edge of the sword, but not as many as have fallen because of the tongue. Happy is the one who is protected from it, who has not been exposed to its anger, [this is against Matthew 5:11-12 & Luke 6:22-23] who has not borne its yoke, and has not been bound with its fetters. For its yoke is a yoke of iron, and its fetters are fetters of bronze; its death is an evil death, and Hades is preferable to it.That's a lie! Worse than Hades? Please note Luke 16:23-24. Hades is definitely worse! Here again Fish falls to his own hyperliteralism. To call the tongue "worse than Hades" is not a lie, but an obvious metaphor. There are many more where Fish takes proverbial verbiage hyperliterally which we will not dignify with a feature. Sirach 29:21 says, The necessities of life are water, bread, and clothing, and also a house to assure privacy. This is worldly wisdom. The necessities of life are food and clothing (1 Timothy 6:8, a house is not included). With these we should be content. As Christ himself had food and clothing, and no house (Matthew 8:20), and was content (being without sin, Hebrews 4:15). I think the pedantic commentary here speasks for itself. Sirach 31:15 says, "Judge your neighbor's feelings by your own," This is against Matthew 7:1-2. We should not judge our neighbor's feelings. That is a poor application of Matthew 7.